My younger brother, clad in an old Cub Scout uniform, marched slowly across the field separating my family home from our grandparent’s farm in southeastern Massachusetts. The American flag he carried flapped in the breeze, and he fell time and again as he took Minié balls from a line of imaginary Confederate soldiers before scattering them with a final charge. 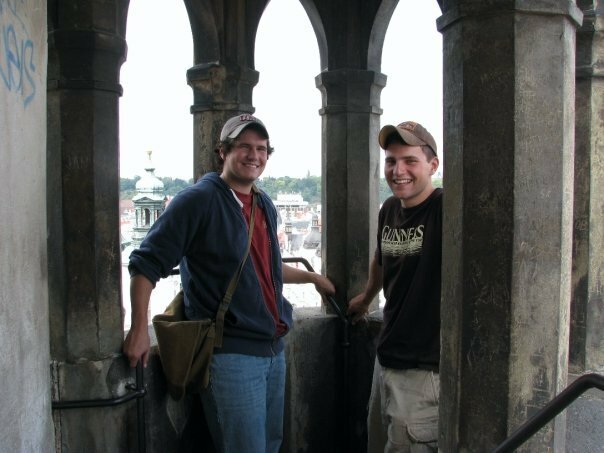 Derrick (left) and Ian Perkins traveled to Prague, Czech Republic on a family vacation in summer 2008, just after Derrick graduated college. Ian was stationed in Grafenwoehr, Germany at the time. Photo courtesy of Derrick Perkins. This is how my brother, Ian, spent his free time when he was 10 years old. I doubt this experience is unlike that of any other boys who grew up in the late 1990s. My brother and I spent long hours pretending we were storming the beaches at Normandy, taking potshots at British regulars or holding the line at Little Round Top. We once dug a trench in our backyard after watching a PBS special on World War I. We were romantics when it came to battles. Wars were small, quick affairs involving special operators, U.N. peacekeepers and long-range bombers. A decade later, I found myself going back and forth with an antiwar protestor after covering a rally at the University of Massachusetts Amherst for the student newspaper. I was learning an early lesson in journalism: admit personal views at your own risk. 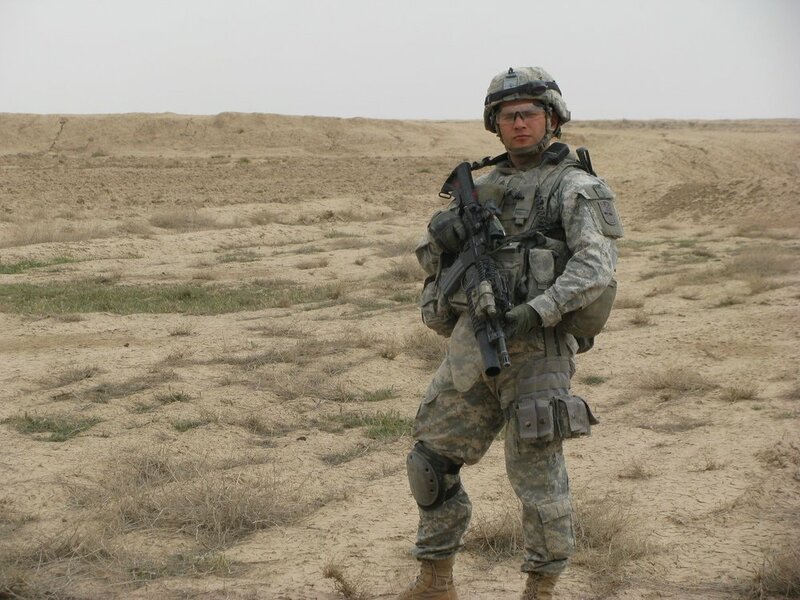 While Ian Perkins hefted a rifle and patrolled the Green Zone in Baghdad, Iraq, his brother, Derrick, attended college in New England. One ate dust; the other walked tree-lined paths. Courtesy of Derrick Perkins. “How can you support the wars when your brother could die?” the activist asked me after I tucked my notepad into my back pocket. “Because I can’t imagine him dying for nothing,” I said. This was the first time I had ever thought about the potential consequences of Ian’s decision. He enlisted in the Army about the same time I started college. While I sipped coffee and pored over books, he waded through swamps in Georgia and learned how to jump into combat. 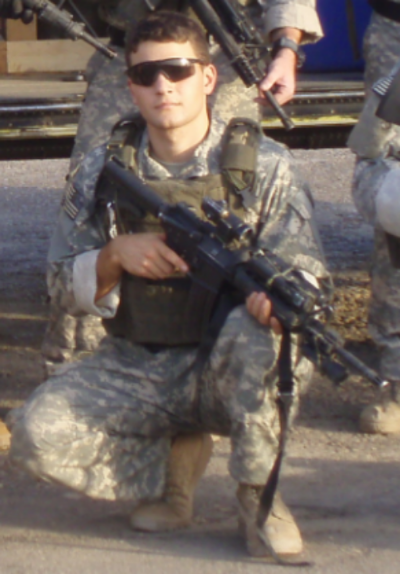 A few years later, he emerged a U.S. Army Ranger and I became a reporter. I remained fascinated by his decision — think curiosity and admiration mixed in with a little bit of guilt. I had spoken with a recruiter and considered military life for myself. I was a high school sophomore on September 11, 2001. We worried about a potential draft, and we were one of the first classes to applaud our soon-to-be enlisted peers at graduation, knowing they would probably go off to war. But the draft never happened, and given the choice to join the military or go to school, I chose college, where I fell in love with journalism. Part of the joy I felt came from learning more about Ian’s experience through other people’s stories. We were competitive brothers, and at that time, my relationship with Ian was strained. He’d fallen in with the wrong crowd in high school and occasionally “borrowed” my prize possession: a beat up 1992 Pontiac Firebird. Since we didn’t talk very often, I spoke instead with other veterans and their families. Ian Perkins enlisted in the middle-00s and served as a U.S. Ranger. As a young man, he reenacted famous conflicts, like the Battles of Normandy, Verdun and Gettysburg. Courtesy of Derrick Perkins. My job gave me the cover to ask questions most people couldn’t or wouldn’t dare ask. I met all sorts of people, like a 40-something fitness guru who was taking advantage of the Army’s more relaxed enlistment qualifications to join the military and the proud weeping mother of a Marine who died in an automobile accident near Camp Pendleton, California, before ever shipping out. I spoke with civilians who gathered supplies for care packages. I covered Veterans Day parades. There were difficult assignments too, like the death of Staff Sgt. Edmond Lo of Salem, New Hampshire. My job as a local reporter was to interview his family. I hated having to find them so that I could ask them questions just hours after hearing the news. I felt disgustingly fascinated as I sat with his brother in his bedroom and listened to stories about the 23-year-old soldier who gave up a college scholarship to join the Army. Our roles could have been reversed; I could have been mourning my own brother. 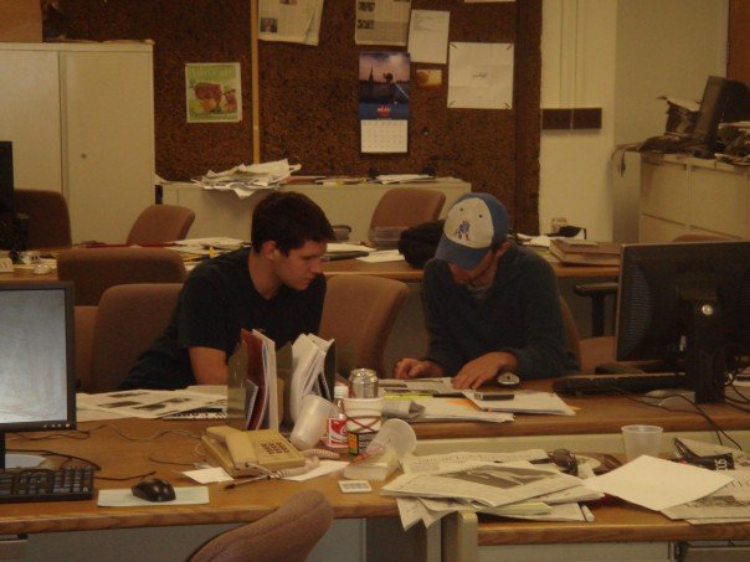 Derrick Perkins (left) trained in spring 2007 to be a news editor at Massachusetts Daily Collegian, the University of Massachusetts Amherst’s student paper. Courtesy of Derrick Perkins. 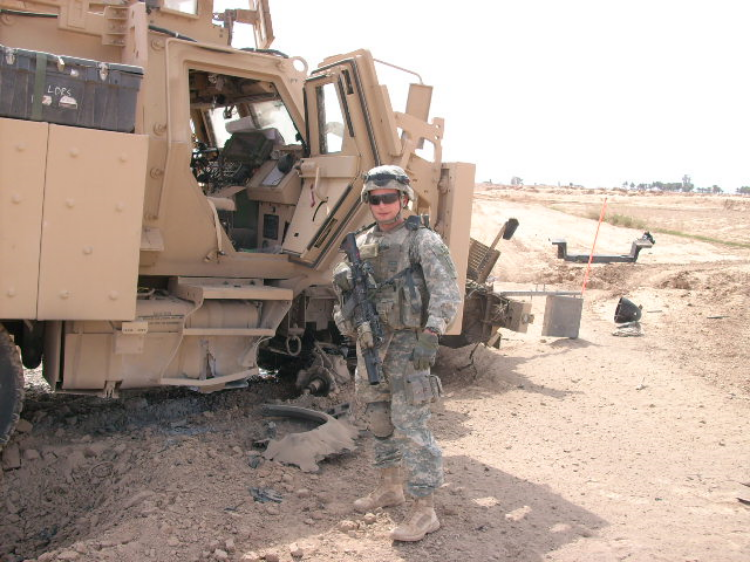 A few days later, I covered the town’s parade before Staff Sgt. Lo’s military funeral. I’m not a praying man, but I did pray for my brother that night. I’ve interviewed hundreds of people connected to the wars, but there’s still a distance between my brother and me. I’ve interviewed lieutenant generals, elicited quotes from nervous and tight-lipped members of the rank-and-file and talked in hushed tones with grieving parents and siblings. But I’ve yet to interview my brother. We have talked since his return. He now attends college and is studying to become an engineer. The night his gear returned home from overseas, we tore through the massive box while he told us stories. My father gathered his awards and put them in a cigar box alongside my great-grandfather’s decorations from World War I.
I’ve thought about asking my brother for an interview, but felt and still do feel a terrible hesitancy: I’m afraid to ask him to stare back into the abyss. But these are the stories our children and grandchildren must hear. I want to be able to tell my future son or daughter more than, “Your uncle was a hero, and he fought in the wars.” I want them to know why he enlisted, why he fought and what he did. 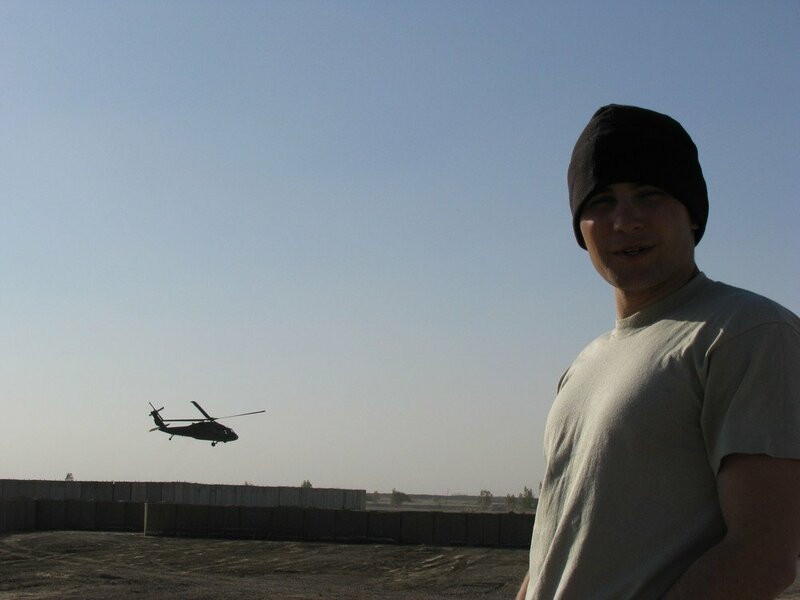 Ian Perkins, pictured here in Baghdad in 2007, served with the 1st Ranger Battalion, 75th Ranger Regiment. Courtesy of Derrick Perkins. I want to know these things as well. I want to know what morning jogs around Baghdad were like, what he felt when he saw a friend die and what life in the moral vagaries of an asymmetrical war were like. I want to be better educated the next time our political leaders talk about a quick and easy conflict. No conflict that’s supposed to be “over by Christmas” ever ends by that promised date. We need to know the cost of conflict, regardless of how much it hurts to ask. I pledge to ask my brother in the coming days about his service. I do not know whether he’ll want to talk about his time at war, but I will ask. JOURNALIST. BROTHER. TRAVELER. Derrick Perkins is a reporter and editor based in Washington, D.C. He has covered a variety of communities over the years, including the U.S. Marine Corps. His writing has appeared in USA Today, The Alexandria Times, New Hampshire Union Leader and Marine Corps Times. He and his brother were born and raised in Massachusetts.